Canopus in Argos: Archives describes a variety of human societies from the cosmic perspective of the more advanced extraterrestrial Canopus civilization, over a vast period of time. For the most part the events in these books are not related to each other, and are separated by millennia. The first volume, Skikasta, is a secret history of Earth revealed as a battleground between the allied galactic empires of Canopus and Sirius, and their enemy Puttiora. Lessing was born in Iran to British subjects, and grew up in Southern Rhodesia (now Zimbabwe). She eventually settled in London. 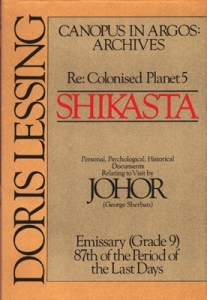 Like many of her other books, Canopus in Argos: Archives explore themes of society and psychology, and also are heavily influenced by the Sufism espoused by the writer and teacher Idries Shah. Lessing’s science fiction books were not well received by critics, her more mainstream “literary” audience, or really even by science fiction readers. 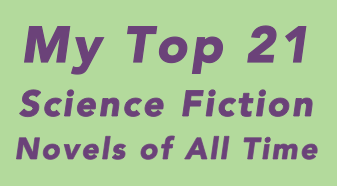 However, these books are rich and beautifully written, and utterly unlike any other science fiction you are likely to encounter.